German tech site ComputerBase reports DDR4 and DDR5 memory was discussed at the Server Memory Forum 2012 in Shenzhen. 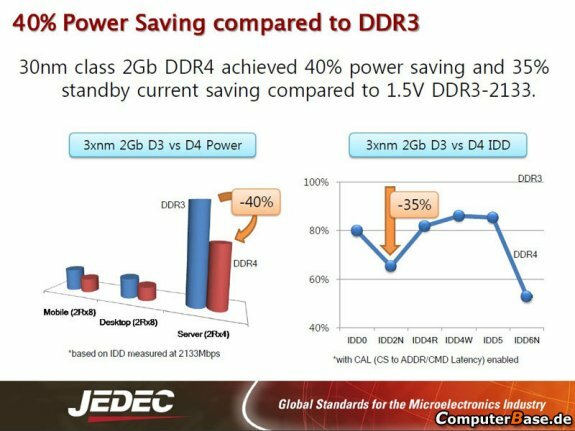 The first 30nm class 2Gb DDR4 chips were developed in Q1 2011 with the latest JEDEC specification at the time, and Hynix plans to enter mass production of JEDEC compliant 20nm class 4Gb DDR4 in the first half of 2013. The first modules will be intended for servers, DDR4 memory for desktop PCs and laptops isn't expected until 2014 or later. The slides reveal ultra-low voltage DDR4-2400 has already been successfully tested at a voltage of just 1.0V, and it seems standard DDR4 will not require more than 1.2V. Compared to 1.5V DDR3-2133, the 30nm class 2Gb DDR4 prototype chips achieve 40 percent power savings in load and a 35 percent standby power reduction.